In the past few weeks, I've played three times at Bootlegger's on Thursday nights. The first time, Ashleigh Caudill asked me to join her along with Ned Luberecki, Dave Goldenberg, and Paul Kramer. Our slot was midnight to 2 am. Jack was in Virginia with his grandmother. I put Cora to bed, and John went to sleep with the monitor by his ear. I hoped for the best. When I showed up downtown at 11:30, Noam was standing out front. Punch Brothers were on the stage, sitting in. While we waited, I picked with Paul on the sidewalk. Because of the week-long CMA festival, the town was packed with country fans. Tourists walked by and stared, thinking we were trying to busk. But for me, any opportunity to pick is golden. It seems rare these days that I am not in charge of at least one non-sleeping child. The picking was fun. I drove Ned to his house, got home at 3:30 am, and realized happily that Cora had not woken up the entire time I was gone. How lucky! The following week, Brad Tucker asked me to join his crew for the 6 pm slot. This time, Bootlegger's hosted a Full Moon Festival, for which they rented out the adjacent parking lot. We played inside with Aaron Till, John Tomlin, and some other folks I hadn't met before. Then we went outside and watched Ronnie McCoury and his crew. These new festivals are an awesome idea, and I hope to return. John had agreed to watch the kids, because he was leaving for Cowan tour at 10 pm. Unfortunately, Cora gave him a run for the money. She refused to sleep for him, and he was frantic trying to get packed when I returned home. Tonight I joined Tomlin once again for the 6 pm slot. I met some new folks. There was a fiddle player in the crew named Brian Arrowwood. He was ridiculously great. His passion for music and for his fiddle was obvious with each solo he took. He looked familiar to me, but I couldn't figure out why. I asked him who he usually plays with. He said, "Everyone." Suddenly it hit me: I asked him if he'd been to Steve Kaufman's Flatpicking Kamp. He said, "Yeah, a long time ago, when I was a kid." Bingo. I'd attended the camp when I was in college, and Brian had been a teenager there. He had really impressed all of us, even back then. Brian is 30 years old, and I can't help but refer to him as the kid from flatpicking camp. Now "the kid" plays with Travis Tritt. The coolest thing about him is that he is not jaded about music. Not one bit. He says he plays in the hotel rooms every day on tour. I've been around a lot of traveling musicians, and it's rare to see people practicing in their hotel rooms. I'm guilty of using my hotel time for emails, phone calls, and "vegging out." I'd like to take a tip from "the kid" and use my time a little more wisely. Hey, at least I'm not on Facebook yet! Thanks for the ride, Cindy! Today I strolled into the Montrose airport and immediately saw the whole crew from our flight to Telluride. 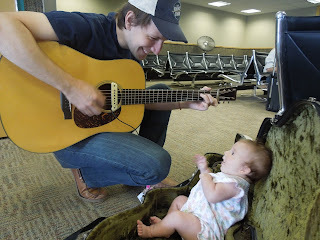 Troubadour Michaela Anne and her mom, Jenny, were again on our flight. There were also several Punch Brothers there, along with Kristin Andreassen and other friends. As usual when I travel with an infant, multitudes of fellow travelers and airport staff were eager to help. 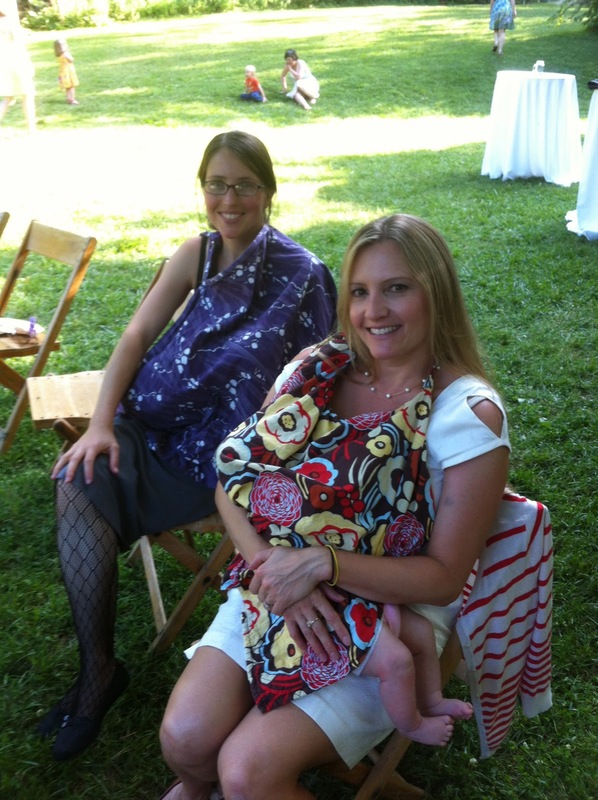 People offered to hold the baby, to carry my guitar, and were kindly in spirit. I had to explain, "No, this is me traveling LIGHT! My 3 year old is at home!" Any mother can relate to this experience: when you travel with a tiny baby, the world is the kindest place. Strangers turn into angels in disguise! I'm so grateful! Yet, when you travel with a 2 year old, when you really need help, the general sentiment is, "Mommy, you're on your own with that mess!" My husband puts it well: everyone glares at the woman who has a jelly-smeared wild animal that poops in his/her pants. I settled into my seat at the gate, and Critter (Chris Eldridge: Punch Bro) sat down beside me. He asked to play my guitar. 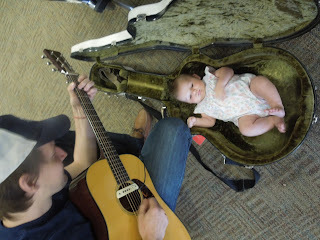 Baby Cora wanted a front row seat, so I placed her in my Calton case and propped her up to watch. She grinned in delight at the Critt, who has always been sweet to my babes. He played her his rendition of "Wildwood Flower" while we travelers all gathered round and snapped photos. It was an adorable scene. 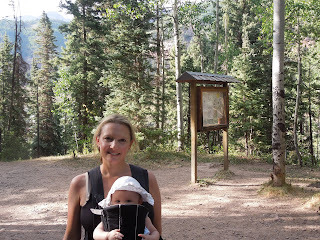 Yesterday, I'd hiked up Bear Creek with Cora strapped to my chest. Cindy and her boys were with me for about a mile, and then Cora and I braved it alone. A couple miles up, we ran into Critter and Kristin hiking down. That was a welcome surprise. 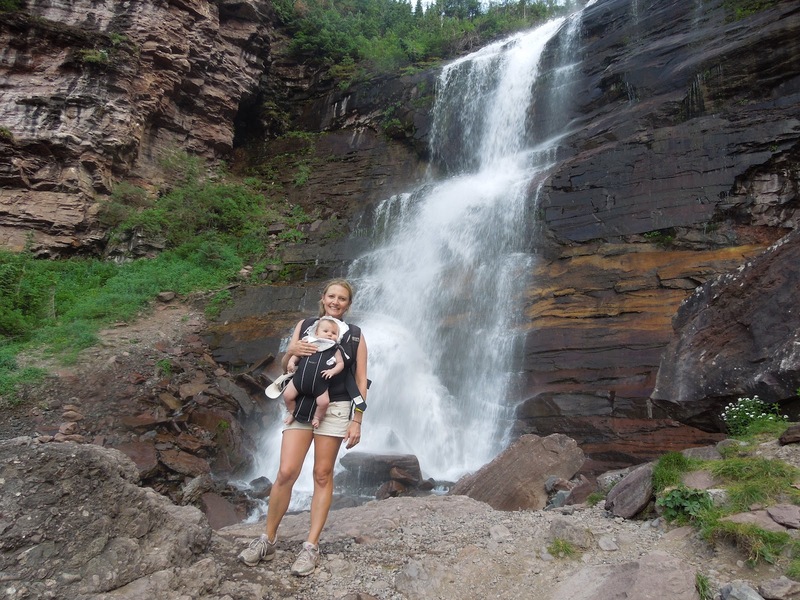 One nap and a tired mommy later, we made it to the majestic waterfall and fantastic views. Spray from the waterfall spewed onto Cora's face, and she made the "shocked" baby face. A lovely stranger offered to take my photo and held my hand through some rocky hiking. I settled in to nurse Cora while sitting on a boulder and took in the views of Sneffels Highline from afar. On our way down, the sun made its own slow journey behind the mountains, and a pink glow took over the red dirt trail. I sang "Drifting Too Far From the Shore" to my sleepy babe, and the rhythm of my footsteps put her back to sleep. Today, when I strapped Cora in her car seat, the straps were too tight! I realized she hadn't been in a car in a week, and the little fatty has packed on a few (ounces)! Cora traveled very well today. She's starting to transition into baby mode. On our way to Telluride, she was still an infant. She slept, she looked around, she nursed. Today, she demanded active play time from her mom. I stood her up on my lap, I chatted with her, and I held out my fingers so she could try and grab them. She can now intentionally grab my fingers and hold onto them! She is changing so rapidly. On the plane, I pointed things out to her: the sunset, the tiny trees, the clouds. She seemed to actually care! The best part of today was walking into Jack's room. In the glow of the Winnie the Pooh nightlight, he popped up and grinned from ear to ear. I held him close as he kissed me. Hearing that 3 year old voice say, "Mommy!" is better than any song I've ever heard. Here I sit in gorgeous Telluride, Colorado, where the San Juans have once again won my heart. How lucky am I to get to come here once again?! 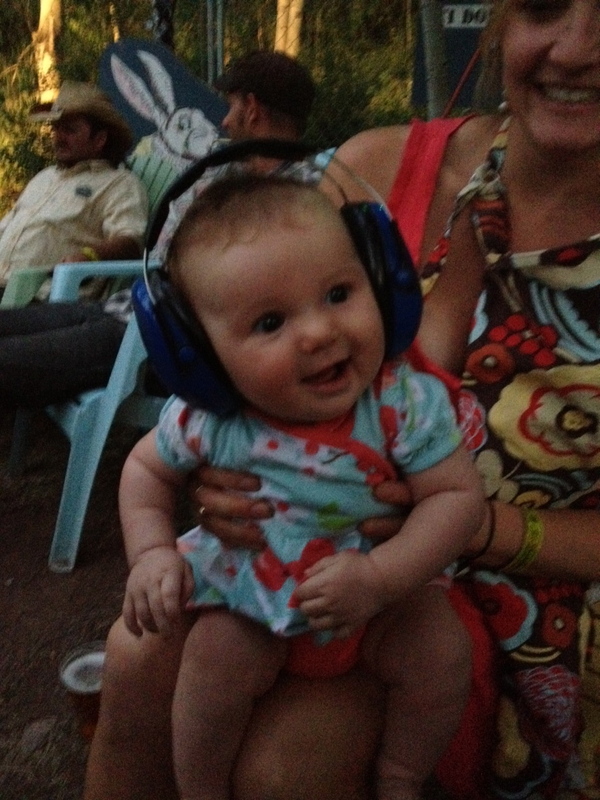 Shortly after I gave birth to Cora, John got booked at the Telluride Bluegrass Festival with John Cowan. Aha, so that's what I've been saving those frequent flier miles for! Somehow, magic was at work, and I actually found a 25k mile ticket to Montrose...AND a 25k mile ticket for my mother to fly to Nashville to stay with Jack! Mommy-cation! The focus of this trip is mommy/daughter time in a beautiful place, with lovely music and wonderful friends (and baby-daddy). My dear friends Cindy & Rick invited me to stay in their guest house, located behind their house in the Town of Telluride. I'm so incredibly grateful for this chance to bond with Cora and listen to music in these spectacular mountains. My buddy Cindy. We were both waitresses and real estate assistants in Telluride when I lived there, long ago. Cora's digs: Cindy's snuggle nest for Cora in the guest house. My sweetie enjoying some floor time, after a long day on the plane. Roughing it, big time: Poser Pit, front row for Alison Krauss set. Judging Telluride Troubadour Finals at Elks Park...with a mini-judge in tow. DJ and banjo picker Nina Schnipper Dropcho. Cora diggin' on the Sam Bush set. So sick! The Cow and the C-Biscuit, after his set with Cora's papa. Photo by Kristin Andreasson. 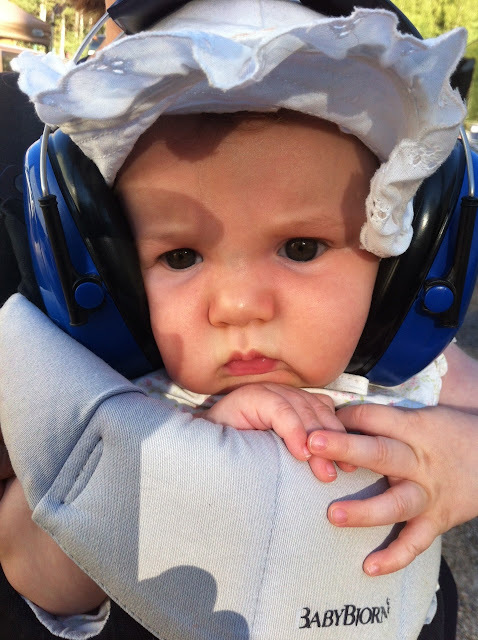 People seem to dig these headphones for babies by Peltor Kids. Sunday afternoon, John invited me to join the "John Frazier & Friends" set at the Elks Park Stage. It was great fun to jam onstage with friends old & new: Jeff Autry, Shad Cobb, Bridget Kearney, Andy Thorn, Jake Jolliff, and of course, John Frazier. John rolled in Saturday night and left Monday morning; I, however, have been granted a full week here in this magical universe. 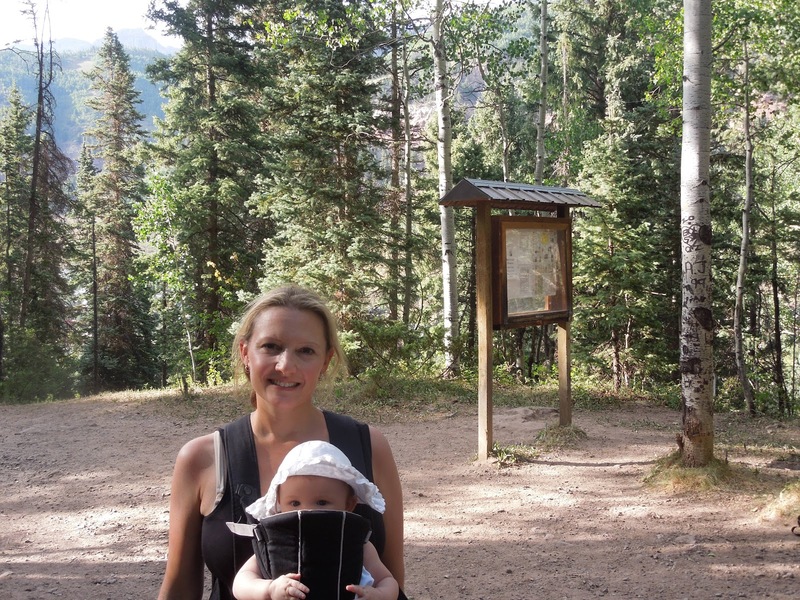 It's only fair that Cora should receive a private Telluride vacation with Mommy. Jack had the same honor when he was ten weeks old. It seems like a perfect way to anoint my babies into this crazy music family life that they will be leading for the next couple decades. And each evening as the sun faded down-valley, and the bright stars started to pop out of black skies, I was able to hug my rainbow baby and bless her chubby cheeks. Thank you, Cora, for making me your mommy! Today Cora and I attended the wedding of two bass players: Bryn Davies and Vince Ilagan. What a pleasure it was to hear Abby sing "At Last" as pregnant Bryn walked through the meadow toward her handsome groom. A helicopter hovered overhead. Abby made flapping motions with her hands to signify windblown hair, and the wedding guests laughed along with her. We saw musical friends and were able to enjoy and talk to many of them, as Jack was still in Richmond. We hadn't seen Molly Nagel in years, and she was there with Emmette. We also met many new folks. John drove back to Knoxville to pick us up after his rehearsal. Bryn has been a good friend to me since I met her in Colorado ten years ago. I'm happy she has found a wonderful husband and baby daddy. It was meaningful to witness their vows and to pray for their future together. May the Lord shine his light, also, on their new baby. This morning, Cora and I awoke to the sound of octave mandolin jamming. We were at Sarah Siskind's and Travis Book's dramatic mountain home in Virginia. We stopped in for the night on our way from Richmond; we're heading to a wedding in Knoxville tomorrow. Cora enjoyed sitting on her godmother's lap to play a little piano; she also enjoyed watching her daddy and buddy Travis playing their instruments. Eventually I joined in to play. I marveled at the fact that I was able to put Cora on the floor on a blanket, and she was perfectly satisfied to watch and listen. We'd left Jack in Richmond to attend a sports day-camp for a week and to spend time alone with his grandparents. I realize that soon I will have another toddler underfoot. Many people think it's a big deal to have an infant and a 2 or 3 year old. I tell them that this is the "calm before the storm." At least I understand that this time, and I can enjoy the relative ease of a 3 month old. Soon, I will be chasing her at all times...but for now, she is my angelic infant, "trailing clouds of glory." This weekend, our children were baptized in my hometown: Richmond, Virginia. We were fortunate to have the Reverend Blanchard officiate this private, beautiful service at St. Stephen's Church. Cora wore a beautiful gown given to her by my cousin, Ashley Epes; Jack wore a lovely white linen suit given to him by our cousin, Shelby Tabeling. My parents hosted a welcome dinner for godparents and family on Saturday night. Amazingly, we had crisp, cool weather with a swollen moon spilling onto the deck. Jack's godfather, Jon Stickley, had driven up from Asheville. Jon, Frazier, and I played bluegrass until late. My godfather, Saint Tucker stayed until late; his daughter and my good friend, Maria Tucker, is one of Cora's godmothers. She'd flown in from Bozeman, Montana, to be a part of the service. "I don't want to be baptized!" Jack kept saying. When Reverend Blanchard doused him with water from the baptismal font, he looked offended but amused. 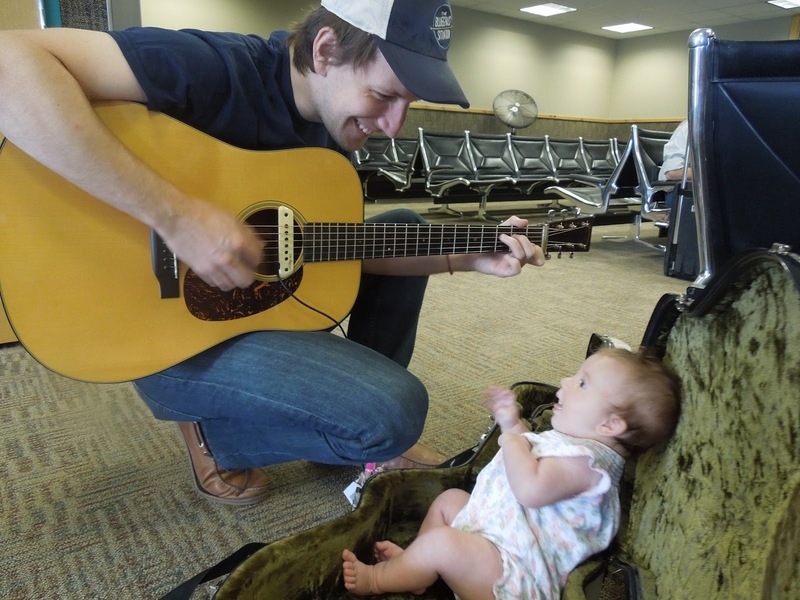 He was not amused, however, when Mommy and Daddy picked up the guitar and mandolin to sing "Where the Soul of Man Never Dies." Indeed: this was supposed to be his service. How dare Mom and Dad take the attention away from him for a minute? He threw a mini-tantrum while we sang. We had a reception at my parents' house. Again, Stickley, Frazier and I played our instruments after the lunch. It ended up being a very musical weekend.